Fertilization is the union of two gamete cells; egg and sperm that combines two paternally prepared genetic materials and that gives rise to a newborn with a distinct genetic background to their parents [1Evans, JP; Florman, HM Nat Cell Biol, 2002, s57.-7Yanagimachi, R Adv Biophys, 2003, 37, 49. [http://dx.doi.org/10.1016/S0065-227X(03)80003-5] ]. Although recent advances in biotechnology (i.e. somatic cell nuclear transfer) has enabled us to create cloned animals in some species including mammals [7Yanagimachi, R Adv Biophys, 2003, 37, 49. [http://dx.doi.org/10.1016/S0065-227X(03)80003-5] ], whose genetic materials are practically as same as their donor animals, there has been no exception in that fertilization is the only mean for natural offspring in sexual reproduction system. Therefore, to understand molecular and cellular mechanism of fertilization has been a long-thought theme in biology and medicine, by which we may establish more effective strategies for medical and pharmaceutical treatments, for agricultural and industrial productions, for taking care of environmental issues, and most of all, for understanding of ourselves, human being. Fertilization, by its terminology, cover several successive aspects of reproduction; including gametogenesis (oogenesis/spermatogenesis and acquisition of ability to be fertilized), gamete interaction with reproductive tract (especially in mammals) and with each other, gamete fusion, activation of egg/oocytes, and establishment and initiation of zygotic development (including implantation in mammals). Practically, however, the research field of fertilization covers more deeply inside from sperm-egg interaction through initiation of development than other processes. In this view, the following three questions have been asked as general and major questions in the fertilization field. How does sperm (or egg) recognize and interact with egg (or sperm)? 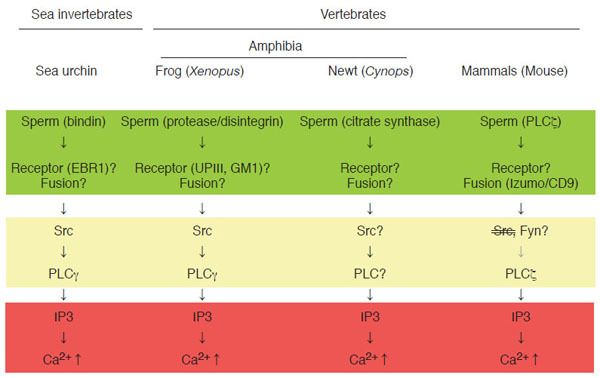 [1Evans, JP; Florman, HM Nat Cell Biol, 2002, s57.-4Runft, LL; Jaffe, LA; Mehlmann, LM Dev Biol, 2002, 245, 237. [http://dx.doi.org/10.1006/dbio.2002.0600] [PMID: 11977978] ] How do sperm and eggs fuse with each other? [8Inoue, N; Yamaguchi, R; Ikawa, M; Okabe, M Soc Reprod Fertil , 2007, 65, 363. [PMID: 17644977] ,9Okabe, M; Cummins, JM Cell Mol Life Sci, 2007, 64, 1945. [http://dx.doi.org/10.1007/s00018-007-7037-7] [PMID: 17558467] ] How does fertilized egg get activated to initiate embryonic development? [10Nuccitelli, R Curr Top Dev Biol, 1991, 25, 1. [http://dx.doi.org/10.1016/S0070-2153(08)60409-3] -13Swann, K; Saunders, CM; Rogers, NT; Lai, FA Semin Cell Dev Biol, 2006, 17, 264. How do Sperm and Egg Interact and Fuse with Each Other? A number of studies have been conducted to answer aforementioned questions by using several model organisms. Not only vertebrates like mammals, birds, reptiles, amphibian, and fishes, but also invertebrates such as insects, nematodes, and sea creatures have been employed. Fig. (1 ) depicts current state of our knowledge on a sequence of events associated with fertilization, in other words, signal transduction of fertilization, by highlighting four organisms analyzed extensively; sea urchin, frog, newt, and mouse. At present, sperm-egg interaction at the plasma membrane level is most uncertain subject. Biochemical and immunochemical studies in the mouse have identified some candidates for sperm-egg membrane interaction; for instance, a disintegrin and metalloproteinase or ADAMs in sperm and integrins in eggs [14Blobel, CP; Wolfsberg, TG; Turck, CW; Myles, DG; Primakoff, P; White, JM Nature, 1992, 356, 248. [http://dx.doi.org/10.1038/356248a0] [PMID: 1552944] ,15Almeida, EA; Huovila, AP; Sutherland, AE; Stephens, LE; Calarco, PG; Shaw, LM; Mercurio, AM; Sonnenberg, A; Primakoff, P; Myles, DG; White, JM Cell, 1995, 81, 1095.]. However, genetic deletion of these molecules by gene knockout could not eliminate the ability of eggs or sperm to undergo membrane interaction, indicating that these molecules are not essential for this process [16Cho, C; Bunch, DO; Faure, JE; Goulding, EH; Eddy, EM; Primakoff, P; Myles, DG Science, 1998, 281, 1857. [http://dx.doi.org/10.1126/science.281.5384.1857] [PMID: 9743500] -18He, ZY; Brakebusch, C; Fässler, R; Kreidberg, JA; Primakoff, P; Myles, DG Dev Biol, 2003, 254, 226. [http://dx.doi.org/10.1016/S0012-1606(02)00043-X] ]. Until now, no gene knockout experiments have succeeded in obtaining phenotype that sperm-egg interaction is impaired. On the other hand, the same experimental approach has identified two gene products, egg CD9 [19Le Naour, F; Rubinstein, E; Jasmin, C; Prenant, M; Boucheix, C Science, 2000, 287, 319. [http://dx.doi.org/10.1126/science.287.5451.319] [PMID: 10634790] -21Kaji, K; Oda, S; Shikano, T; Ohnuki, T; Uematsu, Y; Sakagami, J; Tada, N; Miyazaki, S; Kudo, A Nat Genet, 2000, 24, 27. [http://dx.doi.org/10.1038/73502] [PMID: 10700183] ] and sperm Izumo [8Inoue, N; Yamaguchi, R; Ikawa, M; Okabe, M Soc Reprod Fertil , 2007, 65, 363. [http://dx.doi.org/10.1007/s00018-007-7037-7] [PMID: 17558467] ,22Inoue, N; Ikawa, M; Isotani, A; Okabe, M Nature, 2005, 434, 234. [http://dx.doi.org/10.1038/nature03362] [PMID: 15759005] ], as essential components for sperm-egg membrane fusion in mouse. CD9 is a member of tetraspanin molecules that contain four transmembrane domains as well as two extracellular loops and two cytoplasmic sequences. It is also known that CD9 constitutes a protein complex with certain kinds of integrin, a cell adhesion protein, and serves as membrane organizer [23Runge, KE; Evans, JE; He, ZY; Gupta, S; McDonald, KL; Stahlberg, H; Primakoff, P; Myles, DG Dev Biol, 2007, 304, 317.-27Tomes, CN Soc Reprod Fertil , 2007, 65, 275. [PMID: 17644969] ]. Recent reports have demonstrated that fragments of egg membranes containing CD9 are transferred to sperm surface, by which sperm may acquire the ability to fertilize egg [28Barraud-Lange, V; Naud-Barriant, N; Bomsel, M; Wolf, JP; Ziyyat, A FASEB J, 2007, 21, 3446. [http://dx.doi.org/10.1096/fj.06-8035hyp] [PMID: 17575263] ]. It should also be noted that sperm surface also express functional integrin complexes that seem to be important for sperm-egg interaction and fusion [29Barraud-Lange, V; Naud-Barriant, N; Saffar, L; Gattegno, L; Ducot, B; Drillet, AS; Bomsel, M; Wolf, JP; Ziyyat, A BMC Dev Biol, 2007, 7, 102.]. Izumo processes an immunoglobulin-like domain in its extracellular sequence [22Inoue, N; Ikawa, M; Isotani, A; Okabe, M Nature, 2005, 434, 234. [http://dx.doi.org/10.1038/nature03362] [PMID: 15759005] ], which has been implicated in molecular interaction in several other immunoglobulin-like domain-containing proteins. Both CD9 and Izumo proteins, however, do not possess intrinsic activity for membrane fusion like SNARE complex. Therefore, it seems that these two proteins act to orchestrates structural assembly and/or function of membrane-associated molecules directly involved in fusion process. Gene knockout approach is not yet available in other species presented in Fig. (1 ). Instead, much larger number as well as size (or volume) of eggs that can be obtained from one animal has enabled researchers to conduct more detailed biochemical and cell biological experiments. It is noteworthy that adult, female mouse would give us ~10 eggs with a diameter of ~200 µm per ovulation, while adult, female frog would give us ~1000 eggs with a diameter of ~1300 µm per ovulation. In sea urchin, sperm post-acrosomal protein bindin [30Glabe, CG; Vacquier, VD USA. Proc Natl Acad Sci , 1978, 75, 881. [http://dx.doi.org/10.1073/pnas.75.2.881] [PMID: 273249] [PMCID: PMC411361] ] and egg EBR1 [31Hirohashi, N; Lennarz, WJ Dev Growth Differ, 2001, 43, 247. [http://dx.doi.org/10.1046/j.1440-169x.2001.00571.x] [PMID: 11422290] ,32Kamei, N; Glabe, CG Genes Dev, 2003, 17, 2502. [http://dx.doi.org/10.1101/gad.1133003] [PMID: 14561772] [PMCID: PMC218143] ] have been identified and characterized as components for species-specific interaction of gametes at the egg vitelline membrane level, although its relationship to gamete fusion and egg activation is unclear. In Xenopus, a sperm protein containing disintegrin sequence, named xMDC16 [33Shilling, FM; Krätzschmar, J; Cai, H; Weskamp, G; Gayko, U; Leibow, J; Myles, DG; Nuccitelli, R; Blobel, CP Dev Biol, 1997, 186, 155.,34Shilling, FM; Magie, CR; Nuccitelli, R Dev Biol, 1998, 202, 113. [http://dx.doi.org/10.1006/dbio.1998.8982] [PMID: 9758707] ], has been suggested to be a component to interact with and activate egg. Synthetic peptides containing disintegrin motifs, such as Lys-Thr-Cys [34Shilling, FM; Magie, CR; Nuccitelli, R Dev Biol, 1998, 202, 113. [http://dx.doi.org/10.1006/dbio.1998.8982] [PMID: 9758707] ], which is present in the xMDC molecule, and Arg-Gly-Asp [35Iwao, Y; Fujimura, T Dev Biol, 1996, 177, 558. [http://dx.doi.org/10.1006/dbio.1996.0185] [PMID: 8806831] ], which has not yet been identified in any of Xenopus sperm proteins, has been shown to activate Xenopus eggs, suggesting the presence of functional integrin(s) on egg surface. Several types of integrin (heterodimer of α and β subunits) have been identified in Xenopus [36DeSimone, DW; Dzamba, B; Davidson, LA Methods Enzymol, 2007, 426, 403. [http://dx.doi.org/10.1016/S0076-6879(07)26017-3] ]; however, their involvement in sperm-egg interaction and egg activation has not yet been demonstrated. Another candidate mechanism for sperm-egg interaction in Xenopus involves proteolysis [37Mizote, A; Okamoto, S; Iwao, Y Dev Biol, 1999, 208, 79. [http://dx.doi.org/10.1006/dbio.1999.9195] [PMID: 10075843] ]. External application of protease such as cathepsin B promotes egg activation in Xenopus, suggesting that sperm-derived cathepsin B-like protease, if present, is involved in gamete interaction and egg activation. In support with this, specific inhibitors for cathepsin B inhibits not only cathepsin B-induced egg activation but also sperm-induced egg activation. As a candidate for protease substrate on the egg surface, a single transmembrane protein uroplakin III has been identified [38Mahbub Hasan, AK; Sato, K; Sakakibara, K; Ou, Z; Iwasaki, T; Ueda, Y; Fukami, Y Dev Biol, 2005, 286, 483. [http://dx.doi.org/10.1016/j.ydbio.2005.08.020] [PMID: 16168405] , for detail see below]. One question arises as to whether such protease-substrate interaction is sufficient for cellular interaction done by egg and sperm. Association of uroplakin III with egg membrane microdomains and its possible functions in sperm-egg interaction and egg activation will be discussed later. Molecular detail of sperm-egg fusion in Xenopus is, as in case of sea urchin, not well understood. The fact that CD9, an egg molecule that is essential for sperm-egg fusion in the mouse, is also present in Xenopus eggs [39Sato, K; Iwasaki, T; Ogawa, K; Konishi, M; Tokmakov, AA; Fukami, Y Development, 2002, 129, 885. [PMID: 11861472] ] would allow researchers to evaluate the function of this molecule in the near future. In summary, mechanisms of sperm-egg interaction and fusion seems to be quite different among model organisms and its understanding at molecular level awaits further investigation. The term “egg activation” means a sum of biological events that culminates in activation of embryonic development. It includes resumption of the egg’s cell cycle (from the metaphase of meiosis II in most mammals and amphibians), block to polyspermy, fusion of female and male nuclei, and synthesis of zygotic genome DNA [2Miyazaki, S Cell Dev Biol, 2006, 17, 233. [http://dx.doi.org/10.1016/j.semcdb.2006.02.007] [PMID: 16549376] ,4Runft, LL; Jaffe, LA; Mehlmann, LM Dev Biol, 2002, 245, 237. [http://dx.doi.org/10.1006/dbio.2002.0600] [PMID: 11977978] ,6Whitaker, M Physiol Rev, 2006, 86, 25. [http://dx.doi.org/10.1152/physrev.00023.2005] [PMID: 16371595] [PMCID: PMC3299562] ,40Tunquist, BJ; Maller, JL Genes Dev, 2003, 17, 683. [http://dx.doi.org/10.1101/gad.1071303] [PMID: 12651887] ]. Cytoplasmic events leading to egg activation have been analyzed extensively in many animal species, and it is well established that transient rise of intracellular Ca2+ concentration, in short Ca2+ transient, plays a universal role in executing egg activation [2Miyazaki, S Cell Dev Biol, 2006, 17, 233. [http://dx.doi.org/10.1006/dbio.2002.0600] [PMID: 11977978] -6Whitaker, M Physiol Rev, 2006, 86, 25. [http://dx.doi.org/10.1152/physrev.00023.2005] [PMID: 16371595] [PMCID: PMC3299562] ,41Berridge, MJ Annu Rev Physiol, 2005, 67, 1. [http://dx.doi.org/10.1146/annurev.physiol.67.040103.152647] [PMID: 15709950] ]. In other words, egg activation is dependent on the occurrence of Ca2+ transient. In support of this, artificial elevation of intracellular Ca2+ concentration can reproduce essentially all events of egg activation. Upstream events of Ca2+ transient are also conserved among species; at least in four organisms shown in Fig. (1 ), phospholipase C-dependent production of inositol 1,4,5-trisphosphate (IP3) act to trigger Ca2+ transient, which will initiate and propagate from the endoplasmic reticulum (Fig. 1 ). Thus, it is interesting to note that, compared to diverse nature of membrane events of fertilization, cytoplasmic mechanism of fertilization are highly conserved among species. Phospholipase C (PLC) is a family of enzymes that comprises of six subspecies: β, δ, γ,ε, η, and ζ [42Rhee, SG Annu Rev Biochem, 2001, 70, 281. 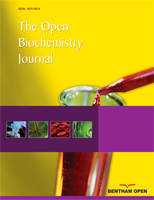 [http://dx.doi.org/10.1146/annurev.biochem.70.1.281] [PMID: 11395409] ,43Stewart, AJ; Morgan, K; Farquharson, C; Millar, RP Neuroendocrinology, 2007, 86, 243. [http://dx.doi.org/10.1159/000107795] [PMID: 17895620] ]. Among them are PLCγ and PLCζ, whose involvement in sperm-induced IP3 production and Ca2+ transient has been demonstrated. In sea urchin and Xenopus, tyrosine phosphorylation of PLCγ, which is catalyzed by Src family tyrosine kinases, is reported to be important for egg activation [12Townley, IK; Roux, MM; Foltz, KR Semin Cell Dev Biol, 2006, 17, 293. [http://dx.doi.org/10.1016/j.semcdb.2006.02.006] [PMID: 16545968] ,44Sato, K; Fukami, Y; Stith, BJ Semin Cell Dev Biol, 2006, 17, 285. [http://dx.doi.org/10.1016/j.semcdb.2006.02.008] [PMID: 16584903] ]. Src-PLCγ pathway is well known to operate in several somatic cell systems such as T-and B-lymphocytes, where cell surface receptors activate this pathway in response to binding to antigenic ligands [45Brown, MT; Cooper, JA Biochim Biophys Acta, 1996, 1287, 121. [PMID: 8672527] -47Abram, CL; Courtneidge, SA Exp Cell Res, 2000, 254, 1. [http://dx.doi.org/10.1006/excr.1999.4732] [PMID: 10623460] ]. In analogy of this, it is believed that sea urchin and Xenopus may utilize sperm-egg membrane interaction to promote signal transduction pathways leading to egg activation, as discussed in detail later. On the other hand, in the mouse, sperm-derived PLCζ has been shown to be involved in initiating egg activation [13Swann, K; Saunders, CM; Rogers, NT; Lai, FA Semin Cell Dev Biol, 2006, 17, 264. [http://dx.doi.org/10.1016/j.semcdb.2006.03.009] [PMID: 16730199] ,48Saunders, CM; Larman, MG; Parrington, J; Cox, LJ; Royse, J; Blayney, LM; Swann, K; Lai, FA Development, 2002, 129, 3533.-51Knott, JG; Kurokawa, M; Fissore, RA; Schultz, RM; Williams, CJ Biol Reprod, 2005, 72, 992. [http://dx.doi.org/10.1095/biolreprod.104.036244] [PMID: 15601914] ]. In this case, sperm-egg fusion, which allows sperm to deliver its constituents: not only genetic materials but also other components including PLCζ, seems to be a critical for initiating egg activation. Thus, upstream events of IP3 production and Ca2+ transient are semi-conservative among species, in which sperm-egg membrane interaction or fusion acts as an initiator of signal transduction pathways leading to activation of PLCs (Fig. 1 ). It should be noted that, in the newt Cynops pyrrhogaster, another mechanism of Ca2+ transient has been show to operate. It involves sperm-egg membrane fusion and introduction of sperm-derived citrate synthase (Fig. 1 ) [52Harada, Y; Matsumoto, T; Hirahara, S; Nakashima, A; Ueno, S; Oda, S; Miyazaki, S; Iwao, Y Dev Biol, 2007, 306, 797. [http://dx.doi.org/10.1016/j.ydbio.2007.04.019] [PMID: 17499700] ]. Molecular mechanism by which citrate synthase induces Ca2+ transient (tyrosine kinase? PLC? IP3?) remains to be clarified. [PMID: 17991443] ]. With experimental basis, membrane microdomains are also called as “detergent-insoluble membrane (DIM)” or “detergent-resistant membranes (DRM)” [53Pike, LJ Biochim Biophys Acta, 2005, 1746, 260.,57Simons, K; Ikonen, E Nature, 1997, 387, 569. [http://dx.doi.org/10.1038/42408] [PMID: 9177342] ,58Rajendran, L; Simons, K J Cell Sci, 2005, 118, 1099. [http://dx.doi.org/10.1242/jcs.01681] [PMID: 15764592] ]. Such detergent-insoluble or resistant nature of membrane microdomains is due to an enrichment of cholesterol and saturated fatty acids that constitute liquid-ordered membranes. Conventional preparation of membrane microdomains involves extraction of cell samples with Triton-X-100 (or other non-ionic detergents)-containing buffer at low temperature, followed by fractionation of the extracts with discontinuous sucrose gradient ultracentrifugation (Fig. 2A ). The resulting fractions containing low-density, detergent-insoluble materials are collected as membrane microdomains. For further details of technical issues and merits of focused approach on egg membrane microdomains in fertilization study, please refer to other literatures [60Sato, K; Yoshino, K; Tokmakov, AA; Iwasaki, T; Yonezawa, K; Fukami, Y Methods Mol Biol, 2006, 322, 395. [http://dx.doi.org/10.1007/978-1-59745-000-3_28] [PMID: 16739739] ,61Sato, K; Iwasaki, T; Sakakibara, K; Itakura, S; Fukami, Y Proteomics, 2002, 2, 1079. As discussed earlier, quality amounts of eggs in Xenopus system has allowed us to perform biochemical characterization of signal transduction pathways leading to egg activation at fertilization. Earlier works in our laboratory have demonstrated that sequential activation of tyrosine kinase Src and PLCγ are required for IP3 production and Ca2+ transient in fertilized Xenopus eggs [62Sato, K; Aoto, M; Mori, K; Akasofu, S; Tokmakov, AA; Sahara, S; Fukami, Y J Biol Chem, 1996, 271, 13250. [http://dx.doi.org/10.1074/jbc.271.22.13250] -65Sato, K; Tokmakov, AA; Iwasaki, T; Fukami, Y Dev Biol, 2000, 224, 453. [http://dx.doi.org/10.1006/dbio.2000.9782] [PMID: 10926780] ]. Subsequent studies focusing on egg membrane microdomains have demonstrated the following: Conventional preparation of membrane microdomains (see above) has allowed us to obtain low-density, detergent-insoluble membrane fractions that are enriched in cholesterol, ganglioside GM1, and cytoplasmic tyrosine kinase Src [39Sato, K; Iwasaki, T; Ogawa, K; Konishi, M; Tokmakov, AA; Fukami, Y Development, 2002, 129, 885. [PMID: 11861472] ], all of which are known membrane microdomain markers in many types of mammalian somatic cells. Fertilization promotes a rapid activation of membrane microdomain-associated Src, as judged by immunoblotting with use of phospho-tyrosine 416-specific antibody that recognizes activated Src molecules [39Sato, K; Iwasaki, T; Ogawa, K; Konishi, M; Tokmakov, AA; Fukami, Y Development, 2002, 129, 885. [PMID: 11861472] ]. Fertilization also promotes a transient recruitment of PLCγ to membrane microdomains, by which it is tyrosine-phosphorylated and activated by Src [65Sato, K; Tokmakov, AA; Iwasaki, T; Fukami, Y Dev Biol, 2000, 224, 453. [http://dx.doi.org/10.1006/dbio.2000.9782] [PMID: 10926780] ,66Sato, K; Tokmakov, AA; He, CL; Kurokawa, M; Iwasaki, T; Shirouzu, M; Fissore, RA; Yokoyama, S; Fukami, Y J Biol Chem, 2003, 278, 38413.]. Application of methyl-β-cyclodextrin, a cholesterol-binding substance that disrupts organization of membrane microdomains, abolishes the activation of Src and subsequent egg activation events in fertilized eggs. Importantly, localization of Src and PLCγ to membrane microdomains is distorted methyl-β-cyclodextrin-treated eggs [39Sato, K; Iwasaki, T; Ogawa, K; Konishi, M; Tokmakov, AA; Fukami, Y Development, 2002, 129, 885. Egg membrane microdomains isolated from unfertilized eggs have been shown to contain functional Src protein. Surprisingly, addition of sperm to this membrane microdomain preparation promotes activation of Src in vitro [66Sato, K; Tokmakov, AA; He, CL; Kurokawa, M; Iwasaki, T; Shirouzu, M; Fissore, RA; Yokoyama, S; Fukami, Y J Biol Chem, 2003, 278, 38413. ], indicating that sperm-interacting machinery, if any, may be functionally preserved in this preparation and that it could be useful for in vitro reconstitution of sperm-egg membrane interaction and subsequent signal transduction. With these assumptions, we have performed several biochemical and cell biological experiments examining the ability of isolated membrane microdomains to reproduce fertilization events. In combination with cell-free extracts prepared form unfertilized Xenopus eggs (so-called cytostatic factor-arrested or CSF extract), sperm-treated membrane microdomain could reproduce Ca2+ transient and subsequent egg activation processes that include resumption of meiotic cell cycle (as judged by the occurrence of morphological change of added sperm nuclei) and dephosphorylation of mitogen-activated protein kinase, an abundant protein serine/threonine kinase that regulates cell cycle of unfertilized eggs and early embryos in Xenopus [60Sato, K; Yoshino, K; Tokmakov, AA; Iwasaki, T; Yonezawa, K; Fukami, Y Methods Mol Biol, 2006, 322, 395. [http://dx.doi.org/10.1007/978-1-59745-000-3_28] [PMID: 16739739] ,66Sato, K; Tokmakov, AA; He, CL; Kurokawa, M; Iwasaki, T; Shirouzu, M; Fissore, RA; Yokoyama, S; Fukami, Y J Biol Chem, 2003, 278, 38413.]. Importantly, pharmacological inhibition or immunochemical depletion of Src or PLCγ shows an inhibitory effect on all of these reconstituted fertilization events. Thus, membrane microdomains prepared from Xenopus eggs have allowed us to perform to some extent in vitro reconstitution of signaling events at fertilization (Fig. 2A ). Focused proteomics approach on egg membrane microdomains has also gained a new insight for signal transduction at fertilization. Immunoblotting of egg membrane microdomain fractions with anti-phosphotyrosine antibody has demonstrated that a 30-kDa protein becomes tyrosine-phosphorylated in fertilized eggs (5 min after insemination). Mass spectrometry analysis has demonstrated that it is uroplakin III (UPIII) [67Sakakibara, K; Sato, K; Yoshino, K; Oshiro, N; Hirahara, S; Mahbub Hasan, AK; Iwasaki, T; Ueda, Y; Iwao, Y; Yonezawa, K; Fukami, Y J Biol Chem, 2005, 280, 15029.]. UPIII is a member of uroplakin family that consists of four members: UPIa and UPIb, both of which are tetraspanin molecules, and UPII and UPIII, both of which are single-transmembrane proteins [68Hu, P; Meyers, S; Liang, FX; Deng, FM; Kachar, B; Zeidel, ML; Sun, TT Am J Physiol Renal Physiol, 2002, 283, F1200. [PMID: 12388410] ,69Jenkins, D; Woolf, AS Kidney Int, 2007, 71, 195. [http://dx.doi.org/10.1038/sj.ki.5002053] [PMID: 17183244] ]. UP family proteins are originally identified in bladder and kidney tissues of mammals. They have been implicated in organizing rigid nature of apical surface of urothelial membrane structures, which involves urothelial plaque containing UPIa/UPII and UPIb/UPIII heterogeneous protein complexes. In addition, UP family proteins have been implicated in urinary bladder carcinomas, and some renal and infectious diseases [69Jenkins, D; Woolf, AS Kidney Int, 2007, 71, 195. [http://dx.doi.org/10.1038/sj.ki.5002053] [PMID: 17183244] -73Ohtsuka, Y; Kawakami, S; Fujii, Y; Koga, F; Saito, K; Ando, N; Takizawa, T; Kageyama, Y; Kihara, K BJU Int, 2006, 97, 1322. 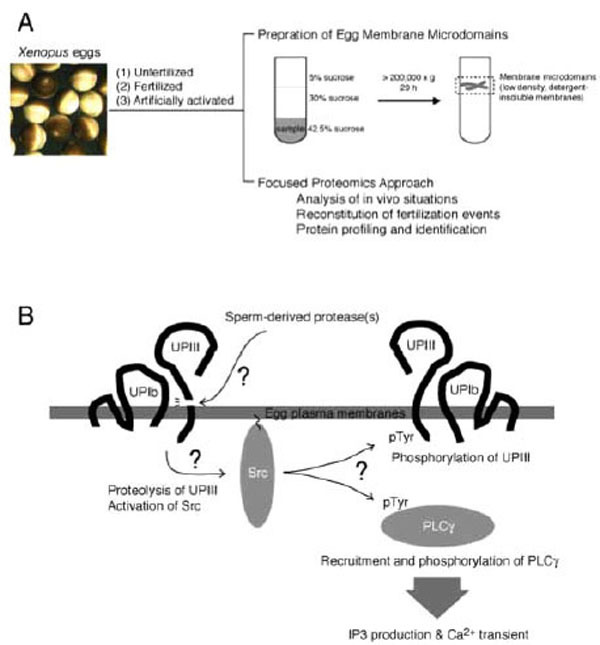 UPIII localizes predominantly to the egg membrane microdomains before and after fertilization [67Sakakibara, K; Sato, K; Yoshino, K; Oshiro, N; Hirahara, S; Mahbub Hasan, AK; Iwasaki, T; Ueda, Y; Iwao, Y; Yonezawa, K; Fukami, Y J Biol Chem, 2005, 280, 15029.]. Exposure of the amino-terminal domain of UPIII on the egg surface has been confirmed by the fact that UPIII is effectively labeled by surface biotinylation of unfertilized Xenopus eggs [67Sakakibara, K; Sato, K; Yoshino, K; Oshiro, N; Hirahara, S; Mahbub Hasan, AK; Iwasaki, T; Ueda, Y; Iwao, Y; Yonezawa, K; Fukami, Y J Biol Chem, 2005, 280, 15029.]. The fact that fertilization promotes phosphorylation of UPIII on tyrosine-249, which locates in the cytoplasmic sequence of this protein (as determined by de novo sequencing with mass spectrometry), suggests that the egg cytoplasmic tyrosine kinase Src, which is also concentrated in membrane microdomains and activated upon fertilization (see above), catalyzes this phosphorylation. In support with this, a pharmacological Src inhibitor PP2 abolishes tyrosine phosphorylation of UPIII. Another supporting evidence is that co-expression of UPIII and Src in 293 human embryonic kidney cells results in effective tyrosine phosphorylation of UPIII [67Sakakibara, K; Sato, K; Yoshino, K; Oshiro, N; Hirahara, S; Mahbub Hasan, AK; Iwasaki, T; Ueda, Y; Iwao, Y; Yonezawa, K; Fukami, Y J Biol Chem, 2005, 280, 15029.,74Mahbub Hasan, AK; Ou, Z; Sakakibara, K; Hirahara, S; Iwasaki, T; Sato, K; Fukami, Y Genes Cells, 2007, 12, 251. [http://dx.doi.org/10.1111/j.1365-2443.2007.01048.x] [PMID: 17295843] ]. Although physiological role of phosphorylation of the UPIII tyrosine-249 is currently unknown, it could be a specific binding site for certain phosphotyrosine-binding protein(s). One interesting candidate is PLCγ, which is recruited to membrane microdomains in fertilized eggs (see above), because this protein contains two Src homology 2 domains that can bind to certain phosphotyrosine-containing sequence. On the other hand, physiological importance of the extracellular domain of UPIII has been suggested by the fact that a specific antibody against the extracellular domain of UPIII shows an inhibitory effect on fertilization in a dose-dependent manner [67Sakakibara, K; Sato, K; Yoshino, K; Oshiro, N; Hirahara, S; Mahbub Hasan, AK; Iwasaki, T; Ueda, Y; Iwao, Y; Yonezawa, K; Fukami, Y J Biol Chem, 2005, 280, 15029.]. The results obtained with anti-UPIII antibody suggest that the extracellular domain of UPIII is required for sperm-egg interaction and/or fusion at fertilization. UPIII has been identified as a target of sperm-derived protease, which has an enzymatic property similar to cathepsin B and is essential for fertilization [38Mahbub Hasan, AK; Sato, K; Sakakibara, K; Ou, Z; Iwasaki, T; Ueda, Y; Fukami, Y Dev Biol, 2005, 286, 483. [http://dx.doi.org/10.1016/j.ydbio.2005.08.020] [PMID: 16168405] ]. The antibody against the extracellular domain of UPIII seems to abolish the proteolytic action of sperm. A synthetic peptide that corresponds to a potential proteolytic site in UPIII (containing Gly-Arg-Arg sequence, a proteolytic motif for cathepsin B) has been shown to block proteolysis of UPIII by sperm protease in vitro and fertilization in vivo [38Mahbub Hasan, AK; Sato, K; Sakakibara, K; Ou, Z; Iwasaki, T; Ueda, Y; Fukami, Y Dev Biol, 2005, 286, 483. [http://dx.doi.org/10.1016/j.ydbio.2005.08.020] [PMID: 16168405] ]. Although these results do not exclude the possibility that other cell surface molecules could also be an important substrate for sperm-derived protease, it is possible to surmise that UPIII is a part of protein complex for interacting with fertilizing sperm. In 293-cell expression system, UPIII requires UPIb for its proper localization to the membrane microdomains [72Tu, L; Sun, TT; Kreibich, G Mol Biol Cell, 2002, 13, 4221. [http://dx.doi.org/10.1091/mbc.E02-04-0211] [PMID: 12475947] [PMCID: PMC138628] ,74Mahbub Hasan, AK; Ou, Z; Sakakibara, K; Hirahara, S; Iwasaki, T; Sato, K; Fukami, Y Genes Cells, 2007, 12, 251. [http://dx.doi.org/10.1111/j.1365-2443.2007.01048.x] [PMID: 17295843] ]. 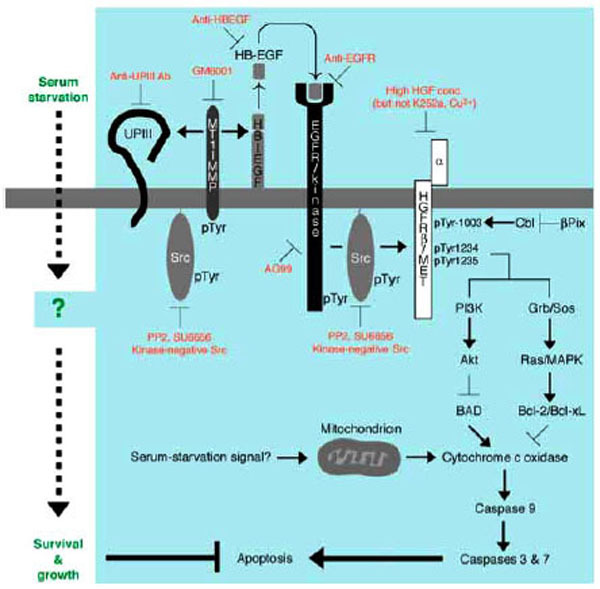 Co-expression of UPIb, UPIII and Src results in inactivation of Src, as judged by elimination of phosphorylation of tyrosine-416, as well as by decrease of tyrosine phosphorylation of other cellular proteins [74Mahbub Hasan, AK; Ou, Z; Sakakibara, K; Hirahara, S; Iwasaki, T; Sato, K; Fukami, Y Genes Cells, 2007, 12, 251. [http://dx.doi.org/10.1111/j.1365-2443.2007.01048.x] [PMID: 17295843] ]. Thus, it is attractive to speculate that in the membrane microdomains of unfertilized eggs, UPIb/UPIII complex serves to negatively regulate Src and that upon fertilization, proteolytic cleavage of UPIII somehow releases the active form of Src inside the egg, thereby Src undergoes phosphorylation of important substrates such as UPIII and PLCγ (Fig. 2B ). Focused proteomics approach on membrane microdomains has also been conducted in sea urchin egg and sperm, and mammalian sperm [75Ohta, K; Sato, C; Matsuda, T; Toriyama, M; Vacquier, VD; Lennarz, WJ; Kitajima, K Glycoconj J, 2000, 17, 205. [http://dx.doi.org/10.1023/A:1026589223811] [PMID: 11201792] -80Weerachatyanukul, W; Probodh, I; Kongmanas, K; Tanphaichitr, N; Johnston, LJ Biochim Biophys Acta, 2007, 1768, 299.]. In particular, sperm membrane microdomains are under extensive investigation with a focus on the roles of glycosphingolipids and other carbohydrates [79Tanphaichitr, N; Carmona, E; Bou Khalil, M; Xu, H; Berger, T; Gerton, GL Front Biosci, 2007, 12, 1748. [http://dx.doi.org/10.2741/2186] [PMID: 17127419] ,80Weerachatyanukul, W; Probodh, I; Kongmanas, K; Tanphaichitr, N; Johnston, LJ Biochim Biophys Acta, 2007, 1768, 299.]. Further study, in combination with molecular biological approach, will be necessary to evaluate the physiological function of membrane microdomains in fertilization. In this sense, relationship of membrane microdomains and sperm-egg fusion system in the mouse (i.e. CD9/Izumo system) will be of quite interest. Understanding of biological functions of cancer cells is of universal importance and prerequisite for establishing effective strategy for prevention, diagnosis, treatment and prognosis of cancer. Since our grasp of cancer as a result of aberrant action of several gene products that regulate normal cellular function, much effort has been made to characterize cellular functions peculiar to cancer cells and its molecular basis [81Weinberg, RA The Biology of Cancer. ; Garland Science : New York, 2007. ,82Weber, GF Molecular Mechanism of Cancer; Springer-Verlag: Berlin, 2007. ]. Apoptosis is a cellular mechanism that maintains a balance of various cellular functions through the active elimination of unnecessary cells from the living organism [83Potten, CS; Wilson, JW Apoptosis The Life and Death of Cells. Cambridge University Press: Cambridge, 2004. ,84Yin, XM; Dong, Z Essentials of Apoptosis A Guide for Basic and Clinical Research. Humana Press: Totowa, 2003. [http://dx.doi.org/10.1385/1592593615] ]. Its appropriate execution is important for proper animal development, namely early embryogenesis, later morphogenesis and body-shape-making. In adult, apoptosis is still important for balancing homeostasis and, as highlighted in this review, for preventing growth of aberrantly proliferating or malignantly transformed cells. All of normal cells, with an important exception in germ cells, will die according to their pre-programmed longevity, in other words, aging and senescence, in which proper arrangement of chromosomes will be distorted [85Serrano, M; Blasco, MA Nat Rev Mol Cell Biol, 2007, 8, 715. [http://dx.doi.org/10.1038/nrm2242] [PMID: 17717516] ,86Campisi, J; d'Adda di Fagagna, F Nat Rev Mol Cell Biol, 2007, 8, 729. There are several experimental conditions that promote apoptosis in cultured cancer cells. They include application of Fas ligand, a death inducer, or anti-Fas antibody, hypoxia, hydrogen peroxide, irradiation, and chemical inhibitors for metabolic enzymes or signaling pathways etc. [87Nagata, S Adv Exp Med Biol, 1996, 406, 119. [http://dx.doi.org/10.1007/978-1-4899-0274-0_12] [PMID: 8910677] -89Tsujimoto, Y Genes Cells, 1998, 3, 697. [http://dx.doi.org/10.1046/j.1365-2443.1998.00223.x] [PMID: 9990505] ]. Serum starvation serves as one of such pro-apoptotic cellular conditions examined to date. At the initial stage of carcinogenesis, cancer cells are not necessarily surrounded by capillary system. Under such microenvironment, however, cancer cells can proliferate effectively; thereby they are capable of inducing angiogenesis that will help cancer cells to populate more and to undergo invasion and metastasis (Fig. 3 ). We have employed human bladder carcinoma cell line 5637 as a model cell system to analyze molecular mechanism of serum starvation-resistant growth of cancer cells [90Ruck, A; Paulie, S Anticancer Res, 1998, 18, 1447. [PMID: 9673354] -92Ruck, A; Jakobson, E; Björkman, S; Paulie, S Anticancer Res, 1994, 14, 55. [PMID: 8166456] ]. Survival and growth of this cell line in serum-free conditions have been reported to involve the actions of ligands for epidermal growth factor receptor/kinase (EGFR/kinase) [93Carpenter, G Sci STKE PE1, 2000, 2000], suggesting that protein tyrosine phosphorylation plays a central part of survival signaling. In support of this, immunoblotting with anti-phosphotyrosine antibody has demonstrated that a number of proteins become tyrosine-phosphorylated in response to serum starvation [94Yamamoto, N; Mammadova, G; Song, RX; Fukami, Y; Sato, K J. Cell Sci, 2006, 119, 4623. [http://dx.doi.org/10.1242/jcs.03236] [PMID: 17062641] ]. Interestingly, time course of increase in tyrosine phosphorylation is quite slow; about eight hours are required for its plateau phase, indicating that up-regulation of EGFR/kinase ligands, if any, may need some hours to be promoted. Immunoprecipitation studies have demonstrated that 170-kDa EGFR/kinase is tyrosine-phosphorylated in serum-starved 5637 cells; however, it is different from a more prominently tyrosine-phosphorylated protein of 145 kDa. Mass spectrometric analysis has demonstrated that it is β-subunit of hepatocyte growth factor receptor/kinase (HGFR/kinase or c-Met). Although HGFR/kinase and its cognate high affinity ligand HGF/scatter factor (SF) have been originally identified in liver cells (hepatocytes), they are ubiquitously expressed in many kinds of cells and tissues, and implicated in a number of cellular functions (growth, differentiation, apoptosis etc.) [95Tulasne, D; Foveau, B Cell Death Differ, 2008, 15, 427. [http://dx.doi.org/10.1038/sj.cdd.4402229] [PMID: 17917681] ,96Jiang, WG; Martin, TA; Parr, C; Davies, G; Matsumoto, K; Nakamura, T Crit Rev Oncol Hematol, 2005, 53, 35. [http://dx.doi.org/10.1016/j.critrevonc.2004.09.004] [PMID: 15607934] ]. Therefore, it is possible to think that, in addition to EGFR/kinase and its ligands, HGFR/kinase and HGF/SF are involved in the survival mechanism of 5637 cells under serum-free conditions. Initiation, promotion and progression of carcinogenesis: from benign tumor to malignant tumor. (A) Survival and growth under microenvironment where no supply of energy and nutrient is available. Serum starvation in cell culture may mimic such a microenvironment in vitro. (B) Anti-apoptotic mechanism of cancer cells. Cell become invasive and enter newly formed capillary (induction of angiogenesis). (C) Newly formed capillary supports growth and survival of tumor. Cells travel through bloodstream and undergo metastasis. This scheme is adapted from “ The Bi9ology of Cancer” by R.A. Weinberg (Garland Science, 2007). Consistently with the previous findings by others that neutralizing antibodies to EGFR/kinase could abolish the growth of 5637 cells under serum-free conditions, a chemical inhibitor for EGFR/kinase (AG99) shows an inhibitory effect on growth of serum-starved 5637 cells. However, neither a potent inhibitor for HGFR/kinase (K252a [97Morotti, A; Mila, S; Accornero, P; Tagliabue, E; Ponzetto, C Oncogene, 2002, 21, 4885. [http://dx.doi.org/10.1038/sj.onc.1205622] [PMID: 12118367] ]) nor a neutralizing substance for HGF/SF (Cu2+ ions [98Wright, TG; Tsai, J; Jia, Z; Elliott, BE J Biol Chem, 2004, 279, 32499. [http://dx.doi.org/10.1074/jbc.M405043200] [PMID: 15161915] ]) showed such an inhibitory effect. Among other pharmacological kinase inhibitors challenged, Src-specific inhibitors (PP2 and SU6656 [99Hanke, JH; Gardner, JP; Dow, RL; Changelian, PS; Brissette, WH; Weringer, EJ; Pollok, BA; Connelly, PA J Biol Chem, 1996, 271, 695. [http://dx.doi.org/10.1074/jbc.271.2.695] -101Sato, K; Iwasaki, T; Hirahara, S; Nishihira, Y; Fukami, Y Biochim Biophys Acta, 2004, 1697, 103.]) were most inhibitory to cell growth in serum-starved 5637 cells. Moreover, both EGFR/kinase inhibitors and Src inhibitors (but not HGFR/kinase inhibitor) were shown to block effectively tyrosine phosphorylation of the 145-kDa c-Met protein (hereafter p145met). Therefore, we conclude that tyrosine phosphorylation of p145met is not due to autophosphorylation of the kinase, but rather due to trans-phosphorylation events catalyzed by EGFR/kinase and/or Src family kinases [94Yamamoto, N; Mammadova, G; Song, RX; Fukami, Y; Sato, K J. Cell Sci, 2006, 119, 4623. [http://dx.doi.org/10.1242/jcs.03236] [PMID: 17062641] ]. In some cancer cells (such as breast cancer), coordinate action of EGFR/kinase and Src has been shown to be required for their malignant phenotype [102Belsches, AP; Haskell, MD; Parsons, SJ Front Biosci, 1997, 2, d501. [PMID: 9331427] -104Leu, TH; Maa, MCF Front Biosci, 2003, 8, s28. [http://dx.doi.org/10.2741/980] [PMID: 12456372] ]. So, our further study has focused on the roles of these two kinases in the molecular mechanism of survival in serum-starved 5637 cells. Inhibition of cell growth in serum-starved 5637 cells in the presence of PP2 involves apoptosis, because concomitant increase of cell death and activation of caspase 3/7-like protease are observed [94Yamamoto, N; Mammadova, G; Song, RX; Fukami, Y; Sato, K J. Cell Sci, 2006, 119, 4623. [http://dx.doi.org/10.1242/jcs.03236] [PMID: 17062641] ]. Importantly, PP2 does not show such an effect on 5637 cells cultured in serum-containing conditions, suggesting that Src activity is specifically required for viability of 5637 cells under serum-free conditions. On the other hand, AG99 shows a growth-inhibitory effect in both culture conditions, indicating that EGFR/kinase activity is required for both culture conditions. In 5637 cells, at least three types of Src family kinases are expressed; Src, Yes, and Fyn. Among them are Src and Yes that are activated in response to serum starvation [94Yamamoto, N; Mammadova, G; Song, RX; Fukami, Y; Sato, K J. Cell Sci, 2006, 119, 4623. Among several ligands for EGFR/kinase [93Carpenter, G Sci STKE PE1, 2000, 2000] are heparin-binding EGF-like growth factor (HB-EGF [105Miyamoto, S; Yagi, H; Yotsumoto, F; Kawarabayashi, T; Mekada, E Cancer Sci, 2006, 97, 341. [http://dx.doi.org/10.1111/j.1349-7006.2006.00188.x] [PMID: 16630129] ,106Raab, G; Klagsbrun, M Biochim Biophys Acta, 1997, 1333, F179. [PMID: 9426203] ]) that may serve as a main component to trigger EGFR/kinase activation in response to serum starvation of the cells. This is demonstrated by the facts that secretion of HB-EGF, but not EGF, into the culture medium is upregulated in serum-starved cells and that a specific antibody to HB-EGF, but not that to EGF, promotes apoptosis of serum-starved 5637 cells (manuscript in preparation). GM6001 [107Rozanov, DV; Deryugina, EI; Ratnikov, BI; Monosov, EZ; Marchenko, GN; Quigley, JP; Strongin, AY J Biol Chem, 2001, 276, 25705. ], a potent inhibitor for matrix metalloproteinase (MMP) that is known to be an important regulator for secretion of HB-EGF and other EGFR/kinase ligands, also promotes apoptosis in serum-starved 5637 cells (manuscript in preparation). Among several kinds of MMPs is membrane type-1 MMP (MT1-MMP [108Itoh, Y; Seiki, M J Cell Physiol, 2006, 206, 1. [http://dx.doi.org/10.1002/jcp.20431] [PMID: 15920734] ]) that may be involved in anti-apoptotic mechanism of serum-starved 5637 cells, because its protein expression is upregulated under serum-free culture conditions, and it becomes associated with Src and phosphorylated on tyrosine residues, which would act as an activating signal for MT1-MMP [109Nyalendo, C; Michaud, M; Beaulieu, E; Roghi, C; Murphy, G; Gingras, D; Béliveau, R J Biol Chem, 2007, 282, 5690. The fact that a potent inhibitor for p145met K252a does not inhibit phosphorylation of p145met and growth 5637 cells [94Yamamoto, N; Mammadova, G; Song, RX; Fukami, Y; Sato, K J. Cell Sci, 2006, 119, 4623. [http://dx.doi.org/10.1242/jcs.03236] [PMID: 17062641] ] suggests that catalytic activity of p145met is not required for anti-apoptotic function of 5637 cells. However, another evidence that apoptosis in serum-starved 5637 cells is promoted by downregulation of p145met by high concentrations of HGF [94Yamamoto, N; Mammadova, G; Song, RX; Fukami, Y; Sato, K J. Cell Sci, 2006, 119, 4623. [http://dx.doi.org/10.1242/jcs.03236] [PMID: 17062641] ], which causes endocytosis and breakdown of p145met [110Peschard, P; Ishiyama, N; Lin, T; Lipkowitz, S; Park, M J Biol Chem, 2004, 279, 29565. [http://dx.doi.org/10.1074/jbc.M403954200] [PMID: 15123609] ,111Peschard, P; Fournier, TM; Lamorte, L; Naujokas, MA; Band, H; Langdon, WY; Park, M Mol Cell, 2001, 8, 995. [http://dx.doi.org/10.1016/S1097-2765(01)00378-1] ], indicates that the presence of tyrosine phosphorylated p145met is required for anti-apoptotic mechanism. Mass spectrometric analysis of p145met prepared from serum-starved cells demonstrates that tyrosine residues 1003, 1234, and 1235 are phosphorylated. Paradoxically, phosphorylation of tyrosine 1003 in p145met has been shown to be important for the interaction with Cbl adaptor protein and subsequent ubiquitin-dependent degradation of the p145met molecule [110Peschard, P; Ishiyama, N; Lin, T; Lipkowitz, S; Park, M J Biol Chem, 2004, 279, 29565. [http://dx.doi.org/10.1074/jbc.M403954200] [PMID: 15123609] ]. Under this background, it will be interesting to examine expression of Cbl and β-Pix. β-Pix is an interacting protein for the PAK protein serine/threonine kinase, which counteracts the action of Cbl-dependent downregulation of receptor/kinases such as EGFR/kinase [112Feng, Q; Baird, D; Peng, X; Wang, J; Ly, T; Guan, JL; Cerione, RA Nat Cell Biol, 2006, 8, 945. [http://dx.doi.org/10.1038/ncb1453] [PMID: 16892055] ,113Wu, WJ; Tu, S; Cerione, RA Cell, 2003, 114, 715. On the other hand, phosphorylation of tyrosine residues 1234 and 1235 may be important more directly to anti-apoptotic mechanism. These phosphotyrosine residues are reportedly important for interaction with and activation of phosphatidylinositol 3-kinase (PI 3-kinase) [95Tulasne, D; Foveau, B Cell Death Differ, 2008, 15, 427. [http://dx.doi.org/10.1038/sj.cdd.4402229] [PMID: 17917681] , 114Ma, PC; Tretiakova, MS; Nallasura, V; Jagadeeswaran, R; Husain, AN; Salgia, R Br J Cancer, 2007, 97, 368. [http://dx.doi.org/10.1038/sj.bjc.6603884] [PMID: 17667909] [PMCID: PMC2360323] ]. Activated PI 3-kinase is responsible for activation of serine/threonine kinase Akt that can phosphorylate and inactivate BAD [115Parcellier, A; Tintignac, LA; Zhuravleva, E; Hemmings, BA Cell Signal, 2008, 20, 21. [http://dx.doi.org/10.1016/j.cellsig.2007.07.010] [PMID: 17716864] ], a proapoptotic protein that upregulates release of cytochrome c oxidase from mitochondria [116Kadenbach, B; Arnold, S; Lee, I; Hüttemann, M Biochim Biophys Acta, 2004, 1655, 400. [http://dx.doi.org/10.1016/j.bbabio.2003.06.005] [PMID: 15100056] ]. As cytochrome c oxidase is known to be a positive regulator of caspase 9, which in turn activates a release of active forms of downstream caspases 3 and 7, the signal cascade involving p145met-PI 3-kinase-Akt serves to act as anti-apoptotic mechanism. Phosphorylated p145met may also recruit Grb2-Sos complex that can activate Ras, a small GTP-binding protein. Ras is well known to act upstream regulators of mitogen-activated protein serine/threonine kinase (MAPK) cascade [117Johnson, GL; Vaillancourt, RR Curr Opin Cell Biol, 1994, 6, 230. [http://dx.doi.org/10.1016/0955-0674(94)90141-4] ]. Activated Ras-MAPK cascade has been shown to promote transcriptional activation of certain kind of genes such as Bcl-2 and Bcl-xL, both of which are anti-apoptosis components that act on the release of cytochrome c from mitochondria [118Chang, F; Steelman, LS; Shelton, JG; Lee, JT; Navolanic, PM; Blalock, WL; Franklin, R; McCubrey, JA Int J Oncol, 2003, 22, 469. Both Src and p145met localize permanently to the membrane microdomains in 5637 cells, and undergo tyrosine phosphorylation in response to serum starvation. On the other hand, EGFR/kinase localizes to membrane microdomains and becomes tyrosine-phosphorylated only after serum starvation of cells. Interestingly, treatment of cells with methyl-β-cyclodextrin results in the disappearance of all of these proteins from the membrane microdomains (manuscript in preparation). This is not due to protein degradation but rather due to re-localization to the non-microdomain fractions. Regardless of the presence of these proteins, however, tyrosine phosphorylation is almost completely blocked in methyl-β-cyclodextrin-treated cells [119Iwasaki, T; Mammadova, G; Yamamoto, N; Tokmakov, AA; Fukami, Y; Sato, K Annu NY Acad Sci , 2008. in press]. These results suggest that not only protein assembly in membrane microdomains but also tyrosine kinase signaling are distorted by the disruption of cholesterol-dependent membrane architecture. Inability of these membrane microdomain-associated molecules to undergo tyrosine phosphorylation may be because of the lack of functional access to MT1-MMP and/or HB-EGF, whose subcellular localization and sensitivity to methyl-β-cyclodextrin are currently unknown. Analysis of membrane microdomains of 5637 cells has also demonstrated a new insight of anti-apoptotic growth of this cell line. By the use of a specific antibody against the extracellular domain of Xenopus UPIII (see above), we have found that a 45-kDa protein homologous to Xenopus UPIII is present in membrane microdomains of 5637 cells. Reportedly, human UPIII migrates at 45-50 kDa on SDS-polyacrylamide gel electrophoresis [70Kong, XT; Deng, FM; Hu, P; Liang, FX; Zhou, G; Auerbach, AB; Genieser, N; Nelson, PK; Robbins, ES; Shapiro, E; Kachar, B; Sun, TT J Cell Biol, 2004, 167, 1195. [http://dx.doi.org/10.1083/jcb.200406025] [PMID: 15611339] [PMCID: PMC2172608] ,72Tu, L; Sun, TT; Kreibich, G Mol Biol Cell, 2002, 13, 4221. [http://dx.doi.org/10.1091/mbc.E02-04-0211] [PMID: 12475947] [PMCID: PMC138628] ]. Treatment of the membrane microdomain fraction with N-glycosidase F results in a reduction of molecular size of the 45-kDa protein to about 30 kDa, which matches with the calculated size of the core protein of human UPIII. Therefore, we conclude that the 45-kDa protein is human UPIII (hereafter designated as p45UPIII). Functional relevance of p45UPIII in anti-apoptotic growth of 5637 cells has been suggested by the following observations: Like UPIII in Xenopus eggs, p45UPIII localizes predominantly to membrane microdomains in 5637 cells (unpublished results). Treatment of 5637 cells with methyl-β-cyclodextrin causes a dissociation of p45UPIII from membrane microdomains, indicating that as in case of EGFR/kinase, Src and p145met, the association of p45UPIII with membrane microdomains depends on its cholesterol-enriched nature. Although a cytoplasmic tyrosine residue, which is phosphorylated in Xenopus egg fertilization (tyrosine 249 in Xenopus UPIII [67Sakakibara, K; Sato, K; Yoshino, K; Oshiro, N; Hirahara, S; Mahbub Hasan, AK; Iwasaki, T; Ueda, Y; Iwao, Y; Yonezawa, K; Fukami, Y J Biol Chem, 2005, 280, 15029. ]), is conserved in p45UPIII (tyrosine 266 in p45UPIII [120Wu, XR; Sun, TT J Cell Sci, 1993, 106, 31. ]), it is not phosphorylated in serum-starved 5637 cells. On the other hand, it is demonstrated that serum starvation promotes partial proteolysis of p45UPIII in a time course that is similar to tyrosine phosphorylation of p145met (it is evident at ~8 h of serum starvation) (unpublished results). Pharmacological characterization of partial proteolysis of p45UPIII has demonstrated that the proteolytic reaction can be blocked effectively GM6001, a potent MMP inhibitor, and some other protease inhibitors such as leupeptin. Interestingly, however, a synthetic peptide, which contains a potential proteolytic site in Xenopus eggs (Gly-Arg-Arg sequence, see above [38Mahbub Hasan, AK; Sato, K; Sakakibara, K; Ou, Z; Iwasaki, T; Ueda, Y; Fukami, Y Dev Biol, 2005, 286, 483. Another evidence that a specific antibody against the extracellular domain of UPIII can block effectively the proteolysis of p45UPIII strongly suggests that proteolysis of p45UPIII occurs, as in the case of Xenopus UPIII, in the extracellular part of the molecule. Importantly, GM6001 or antibody against the UPIII extracellular domain promotes apoptotic cell death in serum-starved 5637 cells (unpublished results). These results raise the possibility that proteolysis of p45UPIII is required for anti-apoptotic mechanism in serum-starved 5637 cells. Furthermore, inhibitors for Src family kinases (PP2 and SU6656) also shows an inhibitory effect on proteolysis of p45UPIII, suggesting that Src activity acts on upstream event of proteolysis; and paradoxically, GM6001 has an inhibitory effect on activation of Src and tyrosine phosphorylation of p145met (unpublished results). Thus, it seems that coordinate and complex network involving proteolysis and tyrosine phosphorylation drives the anti-apoptotic mechanism in 5637 cells. Further approach on membrane microdomains to identify other signaling molecules (e.g. targets of proteolytic action, substrates of tyrosine kinases) as well as gene targeting approach by using knockdown technique (e.g. knockdown of MT1-MMP, p45UPIII etc.) will be useful to understand the molecular basis of sensing of serum-starved culture conditions, executing anti-apoptotic mechanism, and survival and growth of human cancer cells. Evans, JP; Florman, HM Nat Cell Biol, 2002, s57. Miyazaki, S Cell Dev Biol, 2006, 17, 233. Primakoff, P; Myles, DG Science, 2002, 296, 2183. Runft, LL; Jaffe, LA; Mehlmann, LM Dev Biol, 2002, 245, 237. Stricker, SA Dev Biol, 1999, 211, 157. Whitaker, M Physiol Rev, 2006, 86, 25. Yanagimachi, R Adv Biophys, 2003, 37, 49. Inoue, N; Yamaguchi, R; Ikawa, M; Okabe, M Soc Reprod Fertil , 2007, 65, 363. Okabe, M; Cummins, JM Cell Mol Life Sci, 2007, 64, 1945. Nuccitelli, R Curr Top Dev Biol, 1991, 25, 1. Townley, IK; Roux, MM; Foltz, KR Semin Cell Dev Biol, 2006, 17, 293. Swann, K; Saunders, CM; Rogers, NT; Lai, FA Semin Cell Dev Biol, 2006, 17, 264. Blobel, CP; Wolfsberg, TG; Turck, CW; Myles, DG; Primakoff, P; White, JM Nature, 1992, 356, 248. Almeida, EA; Huovila, AP; Sutherland, AE; Stephens, LE; Calarco, PG; Shaw, LM; Mercurio, AM; Sonnenberg, A; Primakoff, P; Myles, DG; White, JM Cell, 1995, 81, 1095. Cho, C; Bunch, DO; Faure, JE; Goulding, EH; Eddy, EM; Primakoff, P; Myles, DG Science, 1998, 281, 1857. Miller, BJ; Georges-Labouesse, E; Primakoff, P; Myles, DG J Cell Biol, 2000, 12, 1289. He, ZY; Brakebusch, C; Fässler, R; Kreidberg, JA; Primakoff, P; Myles, DG Dev Biol, 2003, 254, 226. Le Naour, F; Rubinstein, E; Jasmin, C; Prenant, M; Boucheix, C Science, 2000, 287, 319. Miyado, K; Yamada, G; Yamada, S; Hasuwa, H; Nakamura, Y; Ryu, F; Suzuki, K; Kosai, K; Inoue, K; Ogura, A; Okabe, M; Mekada, E Science, 2000, 287, 321. Kaji, K; Oda, S; Shikano, T; Ohnuki, T; Uematsu, Y; Sakagami, J; Tada, N; Miyazaki, S; Kudo, A Nat Genet, 2000, 24, 27. Inoue, N; Ikawa, M; Isotani, A; Okabe, M Nature, 2005, 434, 234. Runge, KE; Evans, JE; He, ZY; Gupta, S; McDonald, KL; Stahlberg, H; Primakoff, P; Myles, DG Dev Biol, 2007, 304, 317. Ziyyat, A; Rubinstein, E; Monier-Gavelle, F; Barraud, V; Kulski, O; Prenant, M; Boucheix, C; Bomsel, M; Wolf, JP J Cell Sci, 2006, 119, 416. Rubinstein, E; Ziyyat, A; Wolf, JP; Le Naour, F; Boucheix, C Semin Cell Dev Biol, 2006, 17, 254. Le Naour, F; André, M; Boucheix, C; Rubinstein, E Proteomics, 2006, 6, 6447. Tomes, CN Soc Reprod Fertil , 2007, 65, 275. Barraud-Lange, V; Naud-Barriant, N; Bomsel, M; Wolf, JP; Ziyyat, A FASEB J, 2007, 21, 3446. Barraud-Lange, V; Naud-Barriant, N; Saffar, L; Gattegno, L; Ducot, B; Drillet, AS; Bomsel, M; Wolf, JP; Ziyyat, A BMC Dev Biol, 2007, 7, 102. Glabe, CG; Vacquier, VD USA. Proc Natl Acad Sci , 1978, 75, 881. Hirohashi, N; Lennarz, WJ Dev Growth Differ, 2001, 43, 247. Kamei, N; Glabe, CG Genes Dev, 2003, 17, 2502. Shilling, FM; Krätzschmar, J; Cai, H; Weskamp, G; Gayko, U; Leibow, J; Myles, DG; Nuccitelli, R; Blobel, CP Dev Biol, 1997, 186, 155. Shilling, FM; Magie, CR; Nuccitelli, R Dev Biol, 1998, 202, 113. Iwao, Y; Fujimura, T Dev Biol, 1996, 177, 558. DeSimone, DW; Dzamba, B; Davidson, LA Methods Enzymol, 2007, 426, 403. Mizote, A; Okamoto, S; Iwao, Y Dev Biol, 1999, 208, 79. Mahbub Hasan, AK; Sato, K; Sakakibara, K; Ou, Z; Iwasaki, T; Ueda, Y; Fukami, Y Dev Biol, 2005, 286, 483. Sato, K; Iwasaki, T; Ogawa, K; Konishi, M; Tokmakov, AA; Fukami, Y Development, 2002, 129, 885. Tunquist, BJ; Maller, JL Genes Dev, 2003, 17, 683. Berridge, MJ Annu Rev Physiol, 2005, 67, 1. Rhee, SG Annu Rev Biochem, 2001, 70, 281. Stewart, AJ; Morgan, K; Farquharson, C; Millar, RP Neuroendocrinology, 2007, 86, 243. Sato, K; Fukami, Y; Stith, BJ Semin Cell Dev Biol, 2006, 17, 285. Brown, MT; Cooper, JA Biochim Biophys Acta, 1996, 1287, 121. Thomas, SM; Brugge, JS Annu Rev Cell Dev Biol, 1997, 13, 513. Abram, CL; Courtneidge, SA Exp Cell Res, 2000, 254, 1. Saunders, CM; Larman, MG; Parrington, J; Cox, LJ; Royse, J; Blayney, LM; Swann, K; Lai, FA Development, 2002, 129, 3533. Kouchi, Z; Fukami, K; Shikano, T; Oda, S; Nakamura, Y; Ta-kenawa, T; Miyazaki, S J Biol Chem, 2004, 279, 10408. Kurokawa, M; Yoon, SY; Alfandari, D; Fukami, K; Sato, K; Fissore, RA Dev Biol, 2007, 312, 407. Knott, JG; Kurokawa, M; Fissore, RA; Schultz, RM; Williams, CJ Biol Reprod, 2005, 72, 992. Harada, Y; Matsumoto, T; Hirahara, S; Nakashima, A; Ueno, S; Oda, S; Miyazaki, S; Iwao, Y Dev Biol, 2007, 306, 797. Pike, LJ Biochim Biophys Acta, 2005, 1746, 260. Brown, DA; London, E Annu Rev Cell Dev Biol, 1998, 14, 111. London, E; Brown, DA Biochim Biophys Acta, 2000, 1508, 182. Simons, K; Ikonen, E Nature, 1997, 387, 569. Rajendran, L; Simons, K J Cell Sci, 2005, 118, 1099. Kusumi, A; Suzuki, K Biochim Biophys Acta, 2005, 1746, 234. Sato, K; Yoshino, K; Tokmakov, AA; Iwasaki, T; Yonezawa, K; Fukami, Y Methods Mol Biol, 2006, 322, 395. Sato, K; Iwasaki, T; Sakakibara, K; Itakura, S; Fukami, Y Proteomics, 2002, 2, 1079. Sato, K; Aoto, M; Mori, K; Akasofu, S; Tokmakov, AA; Sahara, S; Fukami, Y J Biol Chem, 1996, 271, 13250. Sato, K; Iwasaki, T; Tamaki, I; Aoto, M; Tokmakov, AA; Fukami, Y FEBS Lett, 1998, 424, 113. Sato, K; Iwao, Y; Fujimura, T; Tamaki, I; Ogawa, K; Iwasaki, T; Tokmakov, AA; Hatano, O; Fukami, Y Dev Biol, 1999, 209, 308. Sato, K; Tokmakov, AA; Iwasaki, T; Fukami, Y Dev Biol, 2000, 224, 453. Sato, K; Tokmakov, AA; He, CL; Kurokawa, M; Iwasaki, T; Shirouzu, M; Fissore, RA; Yokoyama, S; Fukami, Y J Biol Chem, 2003, 278, 38413. Sakakibara, K; Sato, K; Yoshino, K; Oshiro, N; Hirahara, S; Mahbub Hasan, AK; Iwasaki, T; Ueda, Y; Iwao, Y; Yonezawa, K; Fukami, Y J Biol Chem, 2005, 280, 15029. Hu, P; Meyers, S; Liang, FX; Deng, FM; Kachar, B; Zeidel, ML; Sun, TT Am J Physiol Renal Physiol, 2002, 283, F1200. Jenkins, D; Woolf, AS Kidney Int, 2007, 71, 195. Kong, XT; Deng, FM; Hu, P; Liang, FX; Zhou, G; Auerbach, AB; Genieser, N; Nelson, PK; Robbins, ES; Shapiro, E; Kachar, B; Sun, TT J Cell Biol, 2004, 167, 1195. Duncan, MJ; Li, G; Shin, JS; Carson, JL; Abraham, SN J Biol Chem, 2004, 279, 18944. Tu, L; Sun, TT; Kreibich, G Mol Biol Cell, 2002, 13, 4221. Ohtsuka, Y; Kawakami, S; Fujii, Y; Koga, F; Saito, K; Ando, N; Takizawa, T; Kageyama, Y; Kihara, K BJU Int, 2006, 97, 1322. Mahbub Hasan, AK; Ou, Z; Sakakibara, K; Hirahara, S; Iwasaki, T; Sato, K; Fukami, Y Genes Cells, 2007, 12, 251. Ohta, K; Sato, C; Matsuda, T; Toriyama, M; Vacquier, VD; Lennarz, WJ; Kitajima, K Glycoconj J, 2000, 17, 205. Yu, S; Kojima, N; Hakomori, SI; Kudo, S; Inoue, S; Inoue, Y Proc Natl Acad Sci, 2002, 99, 2854. Belton RJ, Jr; Adams, NL; Foltz, KR Mol Reprod Dev, 2001, 59, 294. Buttke, DE; Nelson, JL; Schlegel, PN; Hunnicutt, GR; Travis, AJ Biol Reprod, 2006, 74, 889. Tanphaichitr, N; Carmona, E; Bou Khalil, M; Xu, H; Berger, T; Gerton, GL Front Biosci, 2007, 12, 1748. Weerachatyanukul, W; Probodh, I; Kongmanas, K; Tanphaichitr, N; Johnston, LJ Biochim Biophys Acta, 2007, 1768, 299. Weinberg, RA The Biology of Cancer. ; Garland Science : New York, 2007. Weber, GF Molecular Mechanism of Cancer; Springer-Verlag: Berlin, 2007. Potten, CS; Wilson, JW Apoptosis The Life and Death of Cells. Cambridge University Press: Cambridge, 2004. Yin, XM; Dong, Z Essentials of Apoptosis A Guide for Basic and Clinical Research. Humana Press: Totowa, 2003. Serrano, M; Blasco, MA Nat Rev Mol Cell Biol, 2007, 8, 715. Campisi, J; d'Adda di Fagagna, F Nat Rev Mol Cell Biol, 2007, 8, 729. Nagata, S Adv Exp Med Biol, 1996, 406, 119. Nagata, S Curr Biol, 1996, 6, 1241. Tsujimoto, Y Genes Cells, 1998, 3, 697. Ruck, A; Paulie, S Anticancer Res, 1998, 18, 1447. Ruck, A; Paulie, S Anticancer Res, 1997, 17, 1925. Ruck, A; Jakobson, E; Björkman, S; Paulie, S Anticancer Res, 1994, 14, 55. Yamamoto, N; Mammadova, G; Song, RX; Fukami, Y; Sato, K J. Cell Sci, 2006, 119, 4623. Tulasne, D; Foveau, B Cell Death Differ, 2008, 15, 427. Jiang, WG; Martin, TA; Parr, C; Davies, G; Matsumoto, K; Nakamura, T Crit Rev Oncol Hematol, 2005, 53, 35. Morotti, A; Mila, S; Accornero, P; Tagliabue, E; Ponzetto, C Oncogene, 2002, 21, 4885. Wright, TG; Tsai, J; Jia, Z; Elliott, BE J Biol Chem, 2004, 279, 32499. Hanke, JH; Gardner, JP; Dow, RL; Changelian, PS; Brissette, WH; Weringer, EJ; Pollok, BA; Connelly, PA J Biol Chem, 1996, 271, 695. Blake, RA; Broome, MA; Liu, X; Wu, J; Gishizky, M; Sun, L; Courtneidge, SA Mol Cell Biol, 2000, 20, 9018. Sato, K; Iwasaki, T; Hirahara, S; Nishihira, Y; Fukami, Y Biochim Biophys Acta, 2004, 1697, 103. Belsches, AP; Haskell, MD; Parsons, SJ Front Biosci, 1997, 2, d501. Prenzel, N; Zwick, E; Leserer, M; Ullrich, A Breast Cancer Res, 2000, 2, 184. Leu, TH; Maa, MCF Front Biosci, 2003, 8, s28. Miyamoto, S; Yagi, H; Yotsumoto, F; Kawarabayashi, T; Mekada, E Cancer Sci, 2006, 97, 341. Raab, G; Klagsbrun, M Biochim Biophys Acta, 1997, 1333, F179. Rozanov, DV; Deryugina, EI; Ratnikov, BI; Monosov, EZ; Marchenko, GN; Quigley, JP; Strongin, AY J Biol Chem, 2001, 276, 25705. Itoh, Y; Seiki, M J Cell Physiol, 2006, 206, 1. Nyalendo, C; Michaud, M; Beaulieu, E; Roghi, C; Murphy, G; Gingras, D; Béliveau, R J Biol Chem, 2007, 282, 5690. Peschard, P; Ishiyama, N; Lin, T; Lipkowitz, S; Park, M J Biol Chem, 2004, 279, 29565. Peschard, P; Fournier, TM; Lamorte, L; Naujokas, MA; Band, H; Langdon, WY; Park, M Mol Cell, 2001, 8, 995. Feng, Q; Baird, D; Peng, X; Wang, J; Ly, T; Guan, JL; Cerione, RA Nat Cell Biol, 2006, 8, 945. Wu, WJ; Tu, S; Cerione, RA Cell, 2003, 114, 715. Ma, PC; Tretiakova, MS; Nallasura, V; Jagadeeswaran, R; Husain, AN; Salgia, R Br J Cancer, 2007, 97, 368. Parcellier, A; Tintignac, LA; Zhuravleva, E; Hemmings, BA Cell Signal, 2008, 20, 21. Kadenbach, B; Arnold, S; Lee, I; Hüttemann, M Biochim Biophys Acta, 2004, 1655, 400. Johnson, GL; Vaillancourt, RR Curr Opin Cell Biol, 1994, 6, 230. Chang, F; Steelman, LS; Shelton, JG; Lee, JT; Navolanic, PM; Blalock, WL; Franklin, R; McCubrey, JA Int J Oncol, 2003, 22, 469. Wu, XR; Sun, TT J Cell Sci, 1993, 106, 31.